As you know, I began the Wave with a sort of set and finite plan – I was going to just talk about the Wave. There were going to be about ten chapters, each about 20 pages, and that was that. But, as it happened, the process of writing turned into channeling. I am very often surprised myself at what comes from my fingers. His footnote was Ancient Near Eastern Texts Relating to the Old Testament by J. B. Pritchard. Westcott begins his lecture by saying that alchemy means “the Higher Chemistry, treating of the essential nature of the elements, metals and minerals.” In the paragraph that followed this, Westcott says something very odd: he quotes a fourth century astrologer, Julius Firmicus Maternus, who says that skill in alchemy depends on having the Moon in the House of Saturn. Even more confusing, Westcott then asks: “what house does he [Firmicus] mean? The Day (Aquarius) house or the Night (Capricorn) house of Saturn?” And then further confuses everyone by wondering if this fourth century astrologer could have meant the attribution as referring to Uranus. This would be odd since the planet Uranus was not discovered until 1781. Now, note that Westcott deliberately left out Virgo and Libra. In ancient times, Scorpio and Virgo were a double sign. Libra did not exist. Libra was later created and inserted to break up the double sign, which occupied a double space in the zodiacal wheel, so we are not talking about what would be broken down to merely a 10-equal house system here. What was called Scorpio was understood to include Virgo. Thus, it was an 11-sign system, with ten houses, one of them being double in its number of degrees. But, back to the story. These were the only two references that I knew to exist, and I had been looking and asking for several years. I had a dream about it at one point. A high priest appeared, wearing a many-tiered skirt that resembled the Cretan depictions of the goddess – only this was a man. He showed me how the different tiers could be rotated so that certain symbols aligned, which then gave a message. The symbols were zodiacal and the star names were of great significance. The trick was, to align them properly. The same dream then morphed. I was holding a vase that appeared to be onyx or something like that. Others had tossed it on a junk heap and I picked it up and was examining scratch marks all over it. I could see that it was engraved, but that all the grooves were filled with dirt and it was coated with grime. I began to clean it with cotton swabs and water very carefully, going into all the little cracks and tracing out the lines. As I did so and the dirt came away, I was awestruck at the beauty of this vase. It was not only cunningly worked with some great mythical scene being enacted, but it was inlaid with amazing veneers of various colored stones. And, it was also translucent so that the black turned out to be really a deep, translucent purple. The dream morphed again: Ark and I were walking and it seemed to be a park or recreation area of some sort with mountains and cliffs and outcroppings of rock. We were walking around, looking at all the rock formations and shrubbery. The landscape was very dry and obviously in need of rain. As we were following a path I decided to hide in a bush and see how long it took for Ark to notice I was missing, as a joke. And then I suddenly found myself standing on the path ahead of him. “How did you do that?” Ark said. “Well, I ducked into this bush and there was a cleft in the rock, and I started to squeeze into it and something happened and here I am!” I said. He insisted that I go back and show it to him. So, we went back and there was a small cave entrance, looking rather like the broken cleft of the tomb in the Arcadian Shepherds painting. He said it was impossible, too small. So, he stooped down and easily entered the cave. He was in there a long time. Meanwhile, I decided to stay busy by cleaning all the cracks in the rocks around the cave entrance. There was a trickle of water coming out of the cave and I was using some sort of cloth. As I did, the water kept increasing its flow until it was a fountain. At this point, Ark came stumbling out of the cave, holding his eyes, crying tears and laughing at the same time. We decided to leave the park. As we were walking out the entrance, I glanced up at the cliff face and there was a huge mosaic set in the rock. On the right were seven sharks, the bottom one paler than the others. They got darker as they went up, stacked identical images. On the left of the mosaic was a large whale whipping around, its mouth open, eye on the sharks, poised to devour them in a single bite. I told myself I needed to remember this dream. Then I woke up. Q: I had a dream the other night. As Ark and I were leaving the park in my dream, I looked up and saw a mosaic on the side of the mountain. It had seven sharks, one above the other, the lowest being pale almost to the point of transparency, and the highest being very dark and intense in color. There was a huge sperm whale to the upper left. He was in the posture of whipping around, his eye had caught the sharks, and his mouth was open and he was going to swallow them all in a single gulp. What was the meaning of the whale and the sharks? A: Logic says to you: examine! Q: The other part of the dream was that I disappeared and reemerged from a cleft in a rock. I was cleaning … he went to investigate … and he returned and was crying and all this water was flowing out of there like a spring. At another part of the dream, I was cleaning a vase … all this cleaning. What was the significance of this? A: Trace minerals interact with deeply held secrets. And that suggests the Alchemical transformation. Which brings us back again to Zelator. Q: (L) Is the Sufi path a good one to study? A: Up to you. We don’t want to judge that for you. Q: (L) What percentage of truth is in that path. A: In one sense all teachings are truths. Q: (L) Can’t you just tell me? A: Subjective. Would you like us to judge Reiki? Q: (L) Well, yes before I spend any money on it. Will I waste my money? A: Not if you go to right source. Now we have led you to answer we want you to continue to exercise your mind. That is how you progress. Q: (L) So you want me to study Sufi for the exercise? A: Yes. If we answered all your questions you would not learn. Q: (L) In this book I am reading it talks about knowledge that is only given to the elect and that certain things are passed down through secret organizations. Most people think this organization is the Illuminati and that they hold many deep, dark secrets. Is that true? A: Close. But now there is a knowledge explosion. The Illuminati is no longer exclusive; but they still think they are. Q: (L) Compared to the big high mucky mucks in the Illuminati, what percentage of their knowledge do I possess? Q: (L) You mean they know 98 per cent more than I do? As hard as I have worked for these many years? That’s depressing! How much knowledge, relative to the Illuminati, does the average college graduate have? Q: (L) Is there any one person who holds a major chunk of knowledge on this planet? A: By this time next year you will have 35 per cent as much. Well, I guess 35 percent was better than 2 percent! But it made me painfully and acutely aware of how little I actually knew. So here is this book, Zelator, and it is like reading about my own experiences with the Cassiopaeans. The big difference was that the author spent his entire lifetime gathering this information, and I am sure he only wrote what he felt he could safely divulge, concealing things in metaphors and allusions. Not only that, but it is also clear that obtaining his information via human filters, who have obtained their information through other sources which may or may not be closer to a real source has greatly colored or even clouded some of the matters covered in this book. But, this book comes right out and says more truth about some of the secrets than any other book that has, to date, been published. And, as I read it, I was able to fill in the blanks from what I knew. There were certainly a number of crucial keys that I was looking for that Mark Hedsel revealed in his book for others on the Path of the Fool. As we have seen, this mysterious alchemist paid especial attention to the alchemical images which are still found in the sculpted fabric of the French Cathedrals. In particular, Fulcanelli dealt with the secrets within the alchemical imagery of Notre Dame in Paris, and the cathedral at Amiens. Among the most arcane of the many arcane stone quatrefoils on the western facade of Amiens cathedral which intrigued Fulcanelli is a curious image of a heavenly rain. The sheet of water streams like a veritable Niagara from the clouds which, for the mediaeval mind, symbolized heaven. It streams down to the Earth, where, in defiance of natural laws, it gathers into a ball of water which seems to pulsate and tremble, as though it were a ball of flame, rather than a magical liquid. In the quatrefoil, an alchemist looks upon this cascade in awe, pointing with his right hand at the ball of water as though to show that it is a miracle, or something of profound importance. Could he be pointing to this water-ball to indicate that it is something dangerous? The phenomenon is portrayed in distinctly unnatural terms to show that this is no ordinary dew. All the arcane images of the west front of Amiens are contained in quatrefoils. This in itself is a significant thing, for the quatrefoil is made up of four crescents – symbolic of the four phases of the Moon throughout the month. In the quatrefoil which contains the Niagara of water, the heavens open in the uppermost crescent, as if to indicate that this is a lunar Heaven (or sphere), and the magic water it dispenses is a lunar dew. In fact, it is the ‘philosophical dew’ of the alchemists – one of the great Mysteries of this mysterious art. It is not straining ancient mythology too far to see in this cascade the dual streams of the tears of the ‘weeping sisters’, the Egyptian goddesses, Isis and Nephthys, the combined influence of the light and dark Moons. Q: In reading the transcripts, I came across a reference to a “pact” made by a group of STS individuals, and it was called “Rosteem,” and that this was the origin of the Rosicrucians. In the book The Orion Mystery, it talks about the fact that Giza was formerly known as RosTau, which is “Rose Cross.” Essentially, I would like to understand the symbology of the Rose affixed to the Cross. It seems to me that the imagery of Jesus nailed to the Cross is actually the Rose affixed to the Cross. How does Jesus relate to the Rose? A: No, it is from the Rose arose the Cross. Q: What does the cross symbolize? A: The symbology is not the issue. It is the effect. Q: What is the effect of the cross? A: All that has followed it. Q: Could you list some of these to give me a clue? Q: In the same vein, I have noticed that there are two classes of arachnids. There are scorpions and there are spiders. The zodiac was changed by taking the pincers away from the Scorpion and creating out of them the sign of Libra. This image was one of a woman holding a balance scales, usually blindfolded. This was done within recorded history, but was probably formalized through the occult traditions of Kaballah. Now, in trying to figure out who has on what color hat, if there is such a thing, I have come to a tentative conclusion that the spider, or spinner of webs, is the Rosicrucian encampment, and that the Scorpion represents the seeker of wisdom … because, in fact, the word for Scorpio comes from the same root as that which means to pierce or unveil. Therefore, the Scorpion is also Perseus, per Ziu, or “for God.” And the Rosicrucians are the “other,” so to speak. Can you elaborate on this for me? Or comment? A: What a tangled web we spin, when we must not let you in. Q: So, the Rose is the Spider? Q: So, the Rose, with its thorns … can you help me with this Rose image … is the Rose the Scorpion? A: No. Different objective … Rose is a standalone symbol. Q: So, the Rose can be used by either side, is that it? Q: Another derivation of the word root of Scorpio is “skopos,” or “to see.” You said that the human race was seeded on a planet in the constellation Scorpio, and, therefore, when the zodiac was set up and the clues were laid out, it seems to me that the insertion of the sign of Libra was designed to take power away from human beings, to take their hands away, to prevent them from seeing, to make them defenseless. Is this imagery close? Q: (L) I have been digging around about the Templars and have, more or less, come to the conclusion that the whole deal about the destruction of the temple was just a smoke screen, and that something else was going on at the time that was important. I also think that they have been resurrected from time to time and dusted off and blamed for for all this secret knowledge that is supposedly lost … am I on to something here? Q: Who or what brought about the end of the Knights of the Temple? Q: (L) Do you mean that the information that came out, that pamphlet about “Christian Rosenkreutz,” that is a purported fable, might be correct, even if disguised? A: Well, the “worldwide” order is not all inclusive. Q: (L) Is there an inner circle of this order that is unknown? Q: (L) Are the Rosicrucians connected to the Masons? Q: (L) Are the Illuminati connected to the Rosicrucians in any way? Q: (L) Do the Rosicrucians have writings in their keeping that they, themselves, do not understand? A: Yes. So do the Masons. Q: (L) The Priory of Zion, that has been purported to be the progenitor or inheritor of the Templar tradition, is that a mystical organization of great secrecy and import? A: It is a cover for. Q: (L) Another smoke screen. Did you ever notice how the Masons get blamed for so many things of a conspiratorial nature, and nobody ever blames the Rosicrucians or the present day Templars? Don’t you think that is a bit peculiar? Everything is a Masonic conspiracy, but nothing is ever a Rosicrucian conspiracy! Q: In the studies of the Triple Goddess, I came across some interesting things. You suggested that I should research the Third Man theme. I have discovered that the origin of the word “man” originally meant a female – the goddess. The Moon. The oldest word for the male of the species was “wer”, as in “werewolf.” So, the Third Man theme could mean actually, the Triple Goddess. Am I correct? Q: Okay. Tracking the Triple Goddess back to the oldest references, we get to KaliMa. There are all kinds of derivations of this name, but the thing that strikes me is the relationship to the goddess Kell, or Kella, as well as to the word kell, Celts, and how this might be transformed into the word “Cassiopaea.” Can you comment on this? A: Do not the Celts like “Kelly” green? Q: Yes. So. What does “green” have to do with it? A: Keep searching … learning is accomplished thusly, and learning is fun! Q: I once asked about the Third Man theme and that perhaps you meant that the imagery was that of the Triple Goddess relating to the Isle of Man … and you said, “if viewed through sheets of rain.” So, in this book that I am reading, it talks about the fact that the Celts of Gaul worshipped the Rain as the manifestation of the Goddess, and the Celts of Scotland worshipped the Sun … the male God. Does this relate in any way to this remark you made about sheets of rain? A: In an offhand way. Q: Anything further you can tell me in terms of a clue about “sheets of rain”? A: Not for now, when you get there, you will find the chalice. Q: Where and what chalice? Q: (L) What were the names of the children of Jesus? A: You have the clues, and your quest has been admirable so far, why stop now? Q: (L) So, I will find them! Okay. A: Could be like the Holy Grail. Q: (L) What could be like the Holy Grail? Q: (L) What does the chalice represent? A: What is its root? And we find in the dictionary that the root of chalice, in terms of words, is a Latin word, calix, which means a cup. When we look at the word calix, we find that its root is the Indo-European word Kel. Funny that the Cassiopaeans gave me the answer and I didn’t see it when they said “kelly green”. Reading this made me pull out the hairspray again. 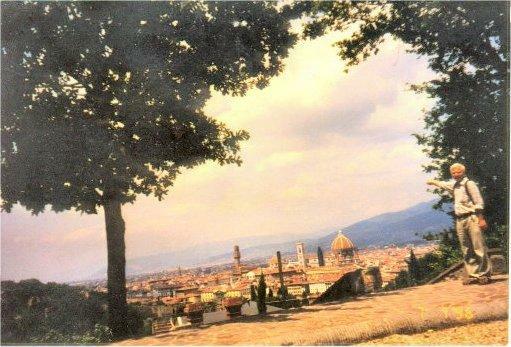 I have on my wall above the desk a photograph of Ark standing almost in this very spot with his arm outstretched, “showing me Florence.” In fact, Ark was on his way to Piazzale Michelangelo, a further ten-minute walk from where he was standing. The date on the photograph is 07-07-96. This was two days after we “met.” Ark was in Florence at that time, working in an ancient monastery. He had taken this walk to think. On the same walk, he went to a nearby gift shop and purchased a postcard to send to me. It was Botticelli’s “Birth of Venus.” So, again, Hedsel is saying things that are personally significant, like markers. Now we understand the inside joke of Westcott’s lecture! Saturn is an anagram for Nature. And we also begin to have an inkling of the Saturnian influence of Nature! Fulcanelli may well be a great initiate into the hermetic lore, yet he is an infuriating Teacher. He teaches, or enlightens, by means of hints and guesses, demanding all the while the full cooperation and attention of his reader. Fulcanelli seems to practise the sol lente, the ‘slow-heat’ method of the alchemist, for he recognizes that a more fierce heat, which may be raised with the bellows, would kill the germinating life within the vessel. A word or a phrase by Fulcanelli can do two things. Either it will spark off unconnected links in one’s mind, yoking together unsuspected words or ideas, and thereby engendering enlightenment. Or, it can have one scurrying in ignorance to the old alchemical and occult books, or resorting to the active contemplation of symbols, which he so often recommends. Both these methods of learning are conducted through the slow inner heat, so beloved by alchemical teachers. Even though the Cassiopaeans have repeatedly told us that certain things must be given in a measured way and that phases must pass, I had never thought of this as the actual alchemical process of being transformed directly. But, here we have the clue that the retort must be heated many times. And we also begin to understand better the alchemical process itself. I had to laugh at this one! I am quite sure that this was addressed directly to all of those who read Fulcanelli and think that rituals are the answer, or that Kaballah is the path. ‘… Western occultism have tended, until comparatively recent times, to emphasize only the light side of the Moon. Even so, hints of the dark Moon are encapsulated in even the most overt-seeming symbolism. ‘Furthermore, in the same Christian tradition, images of the Assumption of the Virgin show the lunar crescent beneath the feet of the Virgin. ‘In these two different symbols, we have a clue to how the Virgin of Light is linked with the angelic ruler of the Moon at the conception of the Child, and with the lunar crescent at her own translation from Earth to Heaven – at her death. It is as though this symbolism was designed to show …’ He paused ‘… to show that the very same lunar forces which announced her destiny as the Mother of God were also lifting her to Heaven, at the end of her life. In the Greek and Roman epics, it is a commonplace for the poets to visualize the gods spinning fate around a man, as though his body were nothing more than a spindle, the inner core being wrapped in the threads from which his destiny was being spun. This notion was extended into the fatalistic activities of the Moirae. The Greek word moira, which meant ‘portion’, was eventually applied to the fate apportioned to an individual, and the three Moirae were adopted as personifications of the notion of allotted destiny. Here I would like to point out that the Cassiopaeans have repeatedly said that the Moon is a “base” for the fourth-density control system. And we might also want to remember the writings of Morris K. Jessupon this matter, most particularly his theory of “null zones” that enable the activation or opening of windows or portals between densities, though he did not express it in those terms. … the ancient hieroglyphic for the Place of the Horizon, which eventually turned into the modern sigil for Libra, is that which separates the infernal from the celestial. ‘… In some ways, the Moon is the greatest problem of esoteric lore. The Moon is not at all what it appears to be. Here, Hedsel’s teacher is suggested to be referring to A. P. Sinnet and his connection to Theosophy and certain revelations that were made in 1932 via the Brotherhood of Luxor, but I think that this was a deliberate misdirection. Gurdjieff was talking about mankind being “food for the Moon” before 1914. Here we find the probable cause for some of the distortion of information in the Way of the Fool. Blavatsky claimed to have inside information, but it seems likely that what she was given was intentionally mixed with half-truths and some lies. ‘In a nutshell, what was made public during this conflict in the Schools was the truth that our Moon is a sort of counterweight to another sphere, which remains invisible to ordinary vision. This counterweighted sphere is called in esoteric circles the Eighth Sphere. Here we find that the Cassiopaeans have gone much further in trying to describe what this teacher is saying (and I am assembling these remarks from all through the book, since they are not in order, probably on purpose). The Cassiopaeans call the idea that this man is struggling to express “fourth density.” Again we see that the clarity of the Cassiopaean materials serves us well in understanding what have for millennia been arcane matters. You don’t say? You mean like: man is food for the Moon? Again either this man doesn’t know how truly deep the mystery is, or he is afraid of scaring his pupils to death! The teacher then goes on to say that the most usual place where this vacuuming of energy happens is among people engaging in spiritualist activities, particularly those having to do with communication with the lower etheric planes, i.e. talking to dead dudes. While I am in agreement with him, for the most part, I think that it is too great a generalization, and the evidence that there is an alien reality that clearly matches what he is talking about in terms of the Moon or the Eighth sphere, should take us far in realizing the true nature of this energy sucking. In fact, the Cassiopaeans are light years ahead of this, even if it is interesting to get a little corroboration from another source. And there may be something very deep in what he says here, considering the plethora of New Age trance channeling, or conscious channeling, and contacts with space brothers going on nowadays. And now, finally, we come to one of the greater blessings of this book that indicated to me how I must view what I am doing. In this excerpt, Mark Hedsel is in conversation with an old man who has been on the Path of the Fool for a very long time. MH: ‘Creativity is the ultimate deed of unselfishness? Sharing your life and trials and fiery initiations through your pages is a raw fire walk on this planet. I know how lonely it feels in the moment of retelling each drama, re-experiencing even the sensory memory that served to strip another layer off your (by now) Zen flesh and Zen bones. Yet at this stage, it is also a refreshingly cool wind that passes through awareness to allow ourselves to be that thoroughly exposed … as if that wind of the exposure is blowing off a little more residual bits of flesh still clinging to our bones. And yet, in reading those truths (those of us who know and can relate), the storytelling is understood to be a beautiful performance art of your soul’s expansion under the tutelage of our future selves. Such a spectacular display of universal love and timelessness and beauty and truth and cosmic humor it is. Yes, when the truth (as lessons and dramas) hit us here in 3rd density in the matrix, we process it as painful (because of our programs) … but after a while, if we learn to relax, life in the matrix is doable. Like anything painful (childbirth, for example) relaxing is the way to avoid the worst of it (and minimize scarring … which is to carry pain into future time). So I see this dance of your posts and the stimulation they provide as an exercise in networking that seems to have a wonderful cosmic purpose. That cosmic purpose is that networking in the matrix is a group lesson that can greatly accelerate both individual and group awareness. Many times I have found this group energy fascinating … for example, a dream of a friend seems to act as a preview of coming attractions of a meditation insight that comes to me, and that is mirrored in the life movie of another friend, etc. … It is my theory that we are moving towards this understanding of group mind and interconnectedness in this coming year. I am feeling we are all going to become much more aware of this networking synchronicity. One of the lessons of duality is to understand we are not really separate beings, but suspended together in one mind. Playing there with telepathy and other ways to explore expanded awareness is a birthright we can claim and enjoy with like-minded others. Thanks, Laura, for being a scout and going out and expanding our playing field comfort zone so we can all expand together. You rock, girl. Can’t wait for the next pages! Thank you, Michele. From one Fool to another. 1 See the discussion of the “Fall From Eden” in session 28 August 1999. 2 Interestingly, John Keel gets very close to these ideas with his notion of “ultraterrestrials” in his book The Eighth Tower. His interpretations of alien/UFO phenomena and their ultimate agenda match up fairly consistently with our own and get even closer to the heart of the matter than Zelator.